Zeng, Z., Lopez-Baez, J. C., Lleras-Forero, L., Brunsdon, H., Wyatt, C., Rybski, W., Hastie, N. D., Schulte-Merker, S. and Patton, E. E. (2018). 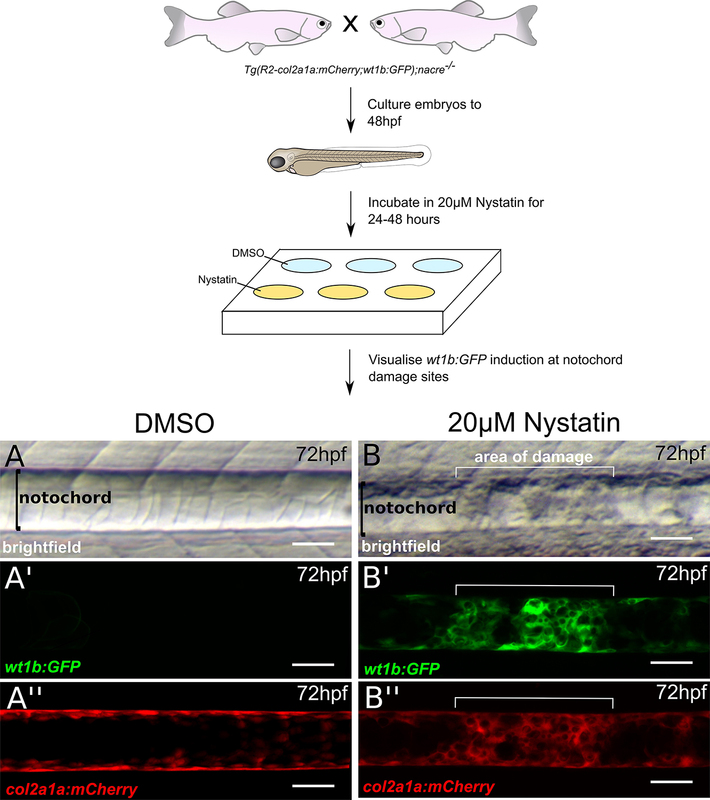 Notochord Injury Assays that Stimulate Transcriptional Responses in Zebrafish Larvae. Bio-protocol 8(23): e3100. DOI: 10.21769/BioProtoc.3100. Lopez-Baez, J. C., Simpson, D. J., L, L. L. F., Zeng, Z., Brunsdon, H., Salzano, A., Brombin, A., Wyatt, C., Rybski, W., Huitema, L. F. A., Dale, R. M., Kawakami, K., Englert, C., Chandra, T., Schulte-Merker, S., Hastie, N. D. and Patton, E. E. (2018). Wilms Tumor 1b defines a wound-specific sheath cell subpopulation associated with notochord repair. Elife 7: e30657. Zebrafish have become an increasingly important model organism in the field of wound healing and regenerative medicine, due to their high regenerative capacity coupled with high-resolution imaging in living animals. In a recent study, we described multiple physical and chemical methods to induce notochord injury that led to highly specific transcriptional responses in notochord cellular subpopulations. The notochord is a critical embryonic structure that functions to shape and pattern the vertebrae and spinal column. 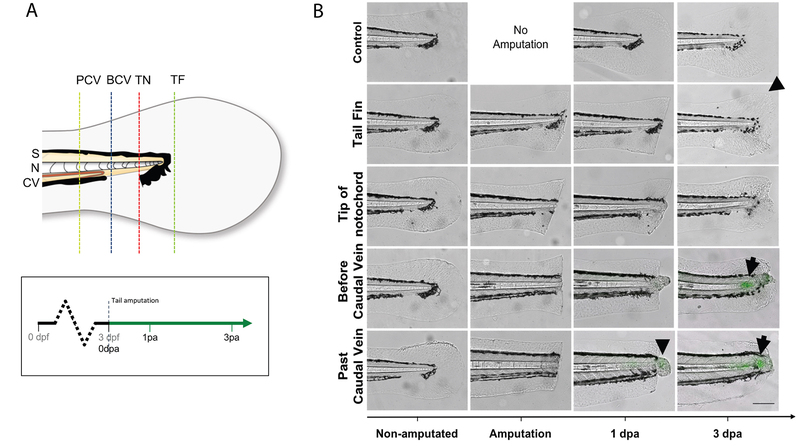 Here, we describe precision needle injury, tail-notochord amputation, and chemical inhibition of caveolin that trigger a wound-specific wt1b expression response in the notochord sheath cell subpopulation. We propose that these procedures can be used to study distinct cell populations that make up the cellular processes of notochord repair. The notochord is a transient embryonic structure that provides axial support and signaling information to the developing embryo (Ellis et al., 2013). It is comprised of two structurally distinct cell populations: the inner vacuolated cells that provide embryo support and structure, and the outer sheath cells that maintain turgor pressure for the vacuolated cells as well as patterning the developing vertebrate spine (Wopat et al., 2018; Lleras Forero et al., 2018; Figure 1A). We have recently discovered that wilms' tumor 1b (wt1b) is specifically expressed in a notochord sheath cell subpopulation that emerges at the site of damage and is maintained throughout repair and formation of adult vertebra structure in zebrafish (Figures 1B and 1C; Lopez-Baez et al., 2018). WT1 is a zinc-finger transcription factor involved in mesodermal tissue development, adult tissue homeostasis, and becomes reactivated during epicardial tissue damage (Hastie et al., 2017). Our discovery that wt1b becomes expressed at the notochord wound may have important implications for the development of therapies for vertebrae spinal injuries or degenerative processes. In zebrafish wounding and regeneration models, injury is induced by a variety of methods such as amputation, surgical resection, irradiation, laser ablation and genetic ablation (Gemberling et al., 2013). 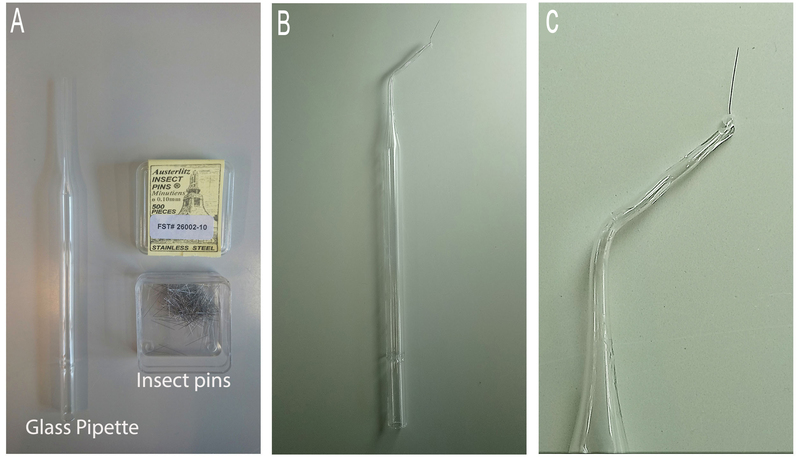 For example, in larval zebrafish, syringe needles of various sizes have been used for tail fin amputation and spinal cord injury experiments (Lisse et al., 2015; Wehner et al., 2017). We have conducted notochord injury assays in zebrafish larvae using physical and chemical approaches (Lopez-Baez et al., 2018). Electrolysis-sharpened tungsten wire and insect pins described here and in our recent paper induce precise, localized injury and trigger wound-specific wt1b expression (Figures 1B and 1C). The structural integrity of the notochord can also be disrupted chemically by treating embryos with nystatin, a small molecule which binds sterols and disassembles caveolae (Rothberg et al., 1992), which are particularly abundant in the notochord (Lim et al., 2017). We detected increased wt1b expression in nystatin treated notochords suggesting changes in caveolae caused by non-physical damage and stress may also induce wt1b expression. Figure 1. Cell populations of the notochord and the wt1b notochord wound response. A. Schematic of the cell populations of the notochord. The notochord is comprised of two physically distinct cell populations: an epithelial-like notochord sheath cell population (outer cells; red) and a large vacuolated notochord cell population (inner cells, green), which are tightly wrapped by a thick, elastic extracellular basement membrane (peri-notochordal sheath). B. Schematic of the zebrafish embryo and the site of the notochord wound at the end of the yolk sac (YS). C. Needle injury triggers localized wt1b:gfp expression in the notochord at the site of damage by 24 h post injury (hpi; arrow). Scale bars = 100 µm in Panel C.
Non-pigmented mitfa mutant (nacre allele) (Lister et al., 1999) may be preferable for ease of imaging. For our experiments, we used the Tg(R2col2a1a:mCherry) transgenic line to visualize notochord sheath cells (Dale and Topczewski, 2011), and the Tg(wt1b:gfp) line to study the wound response in the notochord (Perner et al., 2007). Important: Zebrafish older than 5 days post fertilization are protected animals by UK and EU law and require proper animal procedure licenses and approval from institutional ethics committees. However, users can set up their own equipment. Parts required are: a) DC power supply (3-20 V, such as Bosch C3 smart car battery charger, catalog number: 0092C35000), b) carbon electrode rod (Lasec, catalog number: ERDI9470), c) crocodile clips (optional, DC power supply may come with leads with crocodile clips), d) a 200 ml glass container (jar) with lid. Assemble the equipment: Plug the leads into the charger. Using crocodile clips, connect the carbon electrode rod to the negative terminal (black lead), connect the metal holder to the positive terminal (red lead). Set the voltage to 6 V and fill up the jar with 100 ml of NaOH solution. The equipment is now ready for use. Figure 2. Preparation of electrolysis-sharpened needle. 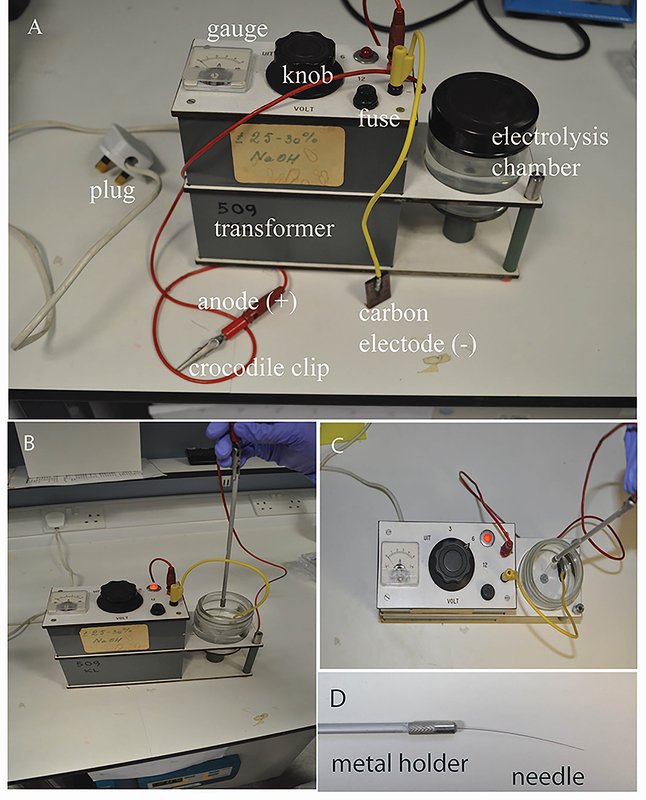 A. Electrolysis-based apparatus, consisting of a rectified DC transformer, an anode with crocodile clip (red), a cathode with carbon electrode (yellow), electrolysis chamber with 5 M NaOH electrolyte. B-C. Lateral and dorsal views of a tungsten wire needle being sharpened. With the power on (6 V), the mounted needle is held vertically and dipped into and out of the electrolyte steadily and slowly until the desired tip is achieved. D. A finished electrolysis-sharpened tungsten wire needle. Cut off 3 cm of tungsten wire and mount it into a needle holder. Connect the metal handle of the needle holder to the (+) terminal of the transformer using a crocodile clip, connect the cathode with carbon plate to the (-) terminal. Place the carbon electrode in the glass chamber with 100 ml of 5 M NaOH solution and switch on the transformer, set the output voltage to 6 V. With the mounted needle held vertically, dip the needle into and out of NaOH, slowly and steadily until desired tip is produced. Faster movement = Longer slope on needle, Slower movement = Shorter tip with more angled slope. The dial gauge of current reads between 0 and 1 A when the needle moves up and down. It takes about 2.5 min to sharpen a needle from 0.25 mm to 0.02 mm in diameter. Take a clean glass pipette and using a Bunsen burner, bend the thin side in the middle in order to create a 45-degree angle. This will help with the injury manipulation procedure. Close the hole of the thin side by about three-quarters using the Bunsen burner. This is done by placing the tip in the strongest part of the flame and rotating it in a circular manner. Take the insect pin with forceps and place it in the hole, taking care that the sharp side is facing the outside. Carefully continue burning the tip of the glass pipette in the weakest part of the flame, until the hole is closed and the insect pin secure. The insect pin will burn if exposed to too much heat. Try to close the hole as much as possible before inserting the pin. Figure 3. Preparation of insect pin. A. The required equipment. B. The finished instrument. C. A close up image of the tip. Weight 1.5 g agarose and melt in 100 ml E3 embryo medium in a 250 ml glass bottle using a microwave oven, pour a thin layer into a Ø 90 mm Petri dish. About 20 ml of 1.5% agarose is used. Let the agarose solidify. Prepare 1:10,000 tricaine solution using E3 embryo medium (please see Recipes), and pour 30 ml in a separate Ø 90 mm Petri dish. Transfer one larva into the tricaine solution and wait until it is anesthetized. Transfer injured larvae to a Petri dish with fresh E3 medium to recover and place the dish at 28.5 °C to grow the larvae to the desired stages. Keep uninjured age-matched larvae as non-injured controls. Cross fish carrying the Tg(wt1b:GFP) and the notochord-marking Tg(R2-col2a1a:mCherry) transgenes in an unpigmented nacre-/- background, to obtain Tg(wt1b:GFP;R2-col2a1a:mCherry);nacre-/- embryos. Prepare fresh 5 mg/ml nystatin stock solution (5.4 mM) before each use by dissolving in DMSO. Dilute nystatin stock solution in E3 to obtain 20 μM final working concentration. Add this to dechorionated 48 hpf embryos in a 6-well plate. Add 0.4% DMSO to control embryos. Incubate embryos at 28.5 °C for up to 48 h. After 24 h of nystatin treatment, lesions appear along the length of the notochord. They tend to appear first in regions that are naturally compressed as the embryo moves, and then spread along the length of the notochord. The majority of embryos acquire notochord lesions, however their size and severity can be variable. Therefore, regular screening for lesions and/or the onset of wt1b:GFP expression is recommended in order to identify embryos with the desired level of notochord damage. For imaging, anesthetize embryos in tricaine (1:10,000), and mount sagittally in 1% low-melt agarose. Brightfield images are taken using a light microscope (Figures 4A and 4B). Expression of the R2-col2a1a:mCherry transgene, which marks the notochord, and the induction of the wt1b:GFP transgene at sites of notochord damage is visualized using confocal microscopy (Figures 4A’ and 4B’’). Figure 4. Disrupting notochord structure using nystatin (modified from Lopez-Baez, 2018). Nystatin is a small molecule which binds sterols and leads to the disassembly of caveolae, a component abundant in the notochord (Lim et al., 2017). Tg(wt1b:GFP;R2-col2a1a:mCherry);nacre-/- zebrafish embryos are treated with either DMSO or 20 μM nystatin from 48 hpf to 72 hpf. When observed under a light microscope, the notochord structure of (A) DMSO-treated embryos appears normal, however lesions can be observed in (B) nystatin-treated embryos. (A’ and B’) wt1b:GFP expression is induced at lesion sites, but not in control notochords. R2-col2a1a:mCherry expression in notochord sheath cells also shows increased cellularity at (B’’) lesion sites of nystatin-treated embryos compared to (A’’) DMSO controls. Scale bars are 50 μm. Prepare 1.5% agarose using E3 embryo medium and pour a thin layer into a Petri dish. Let the agarose solidify. Anaesthetize larvae in tricaine solution. Under a stereomicroscope, place one larva on its side onto the solidified agarose. Remove as much as liquid as possible, so the surface tension adheres the larvae to the dish and prevents it from slipping, then amputate the tail with a sterile scalpel blade with slight pressure. Amputation sites are dependent on experiments being performed (Figure 5). Amputations at the tail fin and tip of notochord site do not include notochord tissue, and do not stimulate a wt1b:gfp notochord injury response. Amputations beyond the tail fin and into the notochord (before caudal vein, past caudal vein) stimulate a wt1b:gfp expression. Figure 5. Selected tail amputations uncover the notochord specificity of the response (modified from Lopez-Baez, 2018). A. Illustration of tail amputations at different tail sites and time points when images are taken. Tail fin (TF), tip of the notochord (TN), before caudal vein (BCV), past caudal vein (PCV), somite (S), notochord (N), caudal vein (CV). B. TF and TN amputated larvae showed no GFP upregulation in their notochord after the injury, but show marked fin regeneration (arrow head). BCV and PCV amputated groups both showed strong GFP upregulations by 72 hpa (arrows), with PCV amputated larvae showing an overall stronger and faster upregulation than BCV amputated larvae. Transfer injured larvae to a Petri dish with fresh E3 medium to recover, and place the dish at 28.5 °C to grow the larvae to the desired stages. Keep uninjured age-matched larvae as non-injured controls. In the UK and EU, all animal procedures need to be approved by the Home Office (UK) or its equivalent. Appropriate Personal Project License (PPL) and Personal individual License (PIL) are required. The procedure of notochord needle injury requires a fair amount of practice, and care should be taken to not cause injury outside the needle injury site. The appearance of a small bulge structure at the site of injury within the notochord about 5 min post-surgery indicates a successful operation. It is achievable to injure 30 larvae during a period of an hour. Optimizing nystatin dosage for the first-time use is recommended, as there is batch-to-batch variation. A longer nystatin incubation period can be attempted however the adverse off-target effects of nystatin cause gross developmental abnormalities and embryos do not survive long-term. In our hands, treatment with 20 μM nystatin from 48 hpf for 24 h gives the most consistent results. Treatment with nystatin before 48 hpf is possible, however, due to its off-target effects, more toxicity is seen. Embryos tolerate later nystatin treatment from 72 and 96 hpf much better, with 20 μM nystatin producing notochord lesions in 60%-80% of embryos after 24 h, although these lesions are smaller in size and fewer per embryo compared those shown in Figure 4. Procedures presented here were approved by the University of Edinburgh Ethics Committee, and performed under the Home Office Project License 70/8000 to EEP at the University of Edinburgh, United Kingdom; and by the Animal Experimentation Committee (DEC) of the Royal Netherlands Academy of Arts and Sciences to SSM at the Hubrecht Institute and the Institute of Cardiovascular Organogenesis and Regeneration WWU Münster, Germany. Brady, J. (1965). A simple technique for making very fine, durable dissecting needles by sharpening tungsten wire electrolytically. Bull World Health Organ 32(1): 143-144. Dale, R. M. and Topczewski, J. (2011). Identification of an evolutionarily conserved regulatory element of the zebrafish col2a1a gene. Dev Biol 357(2): 518-531. Ellis, K., Hoffman, B. D. and Bagnat, M. (2013). The vacuole within: how cellular organization dictates notochord function. Bioarchitecture 3(3): 64-68. Gemberling, M., Bailey, T. J., Hyde, D. R. and Poss, K. D. (2013). The zebrafish as a model for complex tissue regeneration. Trends Genet 29(11): 611-620. Hastie, N. D. (2017). Wilms' tumour 1 (WT1) in development, homeostasis and disease. Development 144(16): 2862-2872. Lim, Y. W., Lo, H. P., Ferguson, C., Martel, N., Giacomotto, J., Gomez, G. A., Yap, A. S., Hall, T. E. and Parton, R. G. (2017). Caveolae protect notochord cells against catastrophic mechanical failure during development. Curr Biol 27(13): 1968-1981 e1967. Lisse, T. S., Brochu, E. A. and Rieger, S. (2015). Capturing tissue repair in zebrafish larvae with time-lapse brightfield stereomicroscopy. J Vis Exp (95): 52654. Lister, J. A., Robertson, C. P., Lepage, T., Johnson, S. L. and Raible, D. W. (1999). Nacre encodes a zebrafish microphthalmia-related protein that regulates neural-crest-derived pigment cell fate. Development 126(17): 3757-3767. Lleras Forero, L., Narayanan, R., Huitema, L. F., VanBergen, M., Apschner, A., Peterson-Maduro, J., Logister, I., Valentin, G., Morelli, L. G., Oates, A. C. and Schulte-Merker, S. (2018). Segmentation of the zebrafish axial skeleton relies on notochord sheath cells and not on the segmentation clock. 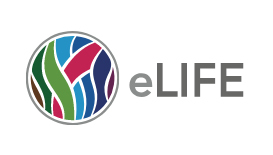 Elife 7: e33843. Perner, B., Englert, C. and Bollig, F. (2007). The Wilms tumor genes wt1a and wt1b control different steps during formation of the zebrafish pronephros. Dev Biol 309(1): 87-96. Rothberg, K. G., Heuser, J. E., Donzell, W. C., Ying, Y. S., Glenney, J. R. and Anderson, R. G. (1992). Caveolin, a protein component of caveolae membrane coats. Cell 68(4): 673-682. Wehner, D., Tsarouchas, T. M., Michael, A., Haase, C., Weidinger, G., Reimer, M. M., Becker, T. and Becker, C. G. (2017). Wnt signaling controls pro-regenerative Collagen XII in functional spinal cord regeneration in zebrafish. Nat Commun 8(1): 126. Wopat, S., Bagwell, J., Sumigray, K. D., Dickson, A. L., Huitema, L. F. A., Poss, K. D., Schulte-Merker, S. and Bagnat, M. (2018). Spine patterning is guided by segmentation of the notochord sheath. Cell Rep 22(8): 2026-2038. Copyright Zeng et al. This article is distributed under the terms of the Creative Commons Attribution License (CC BY 4.0).